The assignment was to do a study in grey scale. 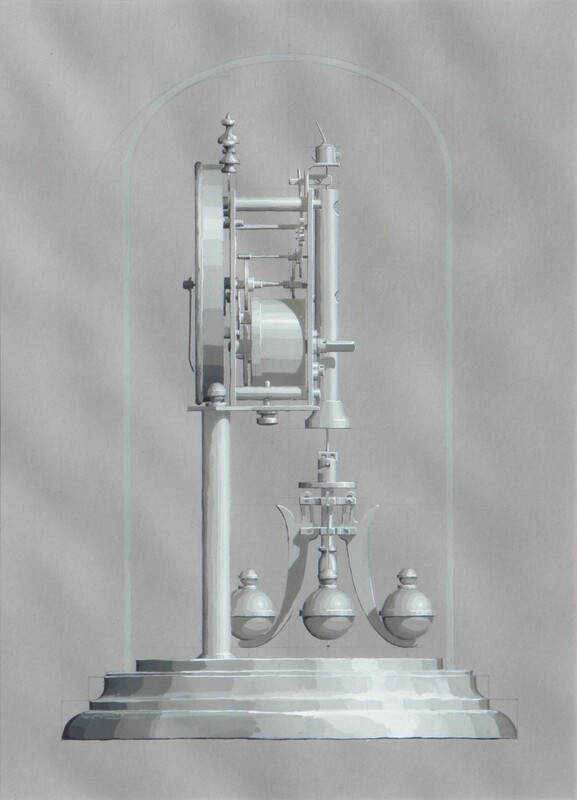 I measured this anniversary clock with a simple vernier calliper and drafted it 1:1 on grey card. Then I had to imagine where the shadows would fall, as there were no shadows to observe. The clock itself, including its mechanism, is shiny brass. The clock has no shadows, only reflections of its surroundings. Gouache on grey matte board. That is amazing! There is another wonder in India, ARANMULA KANNADI. It is made out of a kind of brass metal. But it is a mirror. No Corrosion affecting it! The secrete known only to few Viswakarmas in a village called Aranmula, in Kerala, South India. There is another wonder in India – Corrosion free Iron. Two such pillars are known to me; one in a temple called Kollur Mookambika Temple in Karnataka, South India, and another one in Delhi, India. Thank you for your comment! I heard about the famous Aranmula mirrors, but I did not manage to visit Aranmula when I was in Kerala. I learned about the Delhi iron pillar when I was a child, and I have developed an interest in iron work and blacksmithing, so visiting one of the world’s most famous pieces of iron work at Qtub Minar was a kind of pilgrimage. Thank you for telling me about the pillar at Kollur Mookambika. I looked up a research pdf and the metallurgy at Kollur Mookambika appears to indicate tribal metalworking methods, and attribute the corrosion protection to phosphorous content.